An early snowfall in October threatening to be the start of a six-month winter was enough to put Darina on Google to research suitable cycling destinations for Christmas/New Year. As it happened, Morocco featured in the first three hits. 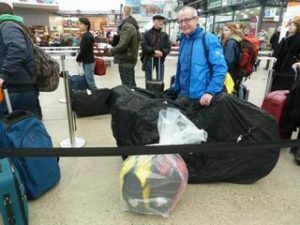 A few further clicks confirmed average temperatures of 20°C by day and with Ryanair flying from nearby Memmingen in Germany, we were sold! Marrakesh, with a population of 2 million, is situated close to the foothills of the high Atlas mountains. It boasts a magnificent medina (walled city) and the biggest square in Africa. This Jemaa El Fna square is an open-air theatre for snake charmers, dancing monkeys, henna hand painters and musicians by day, and then turns into a huge food court once the sun sets. The sales pitch for the numbered food stalls come in entertaining rhymes like: Eat with us – we guarantee, 2 years diarrhoea free. Remember: Stall one one seven, is highway to heaven! The whole medina is comprised of numerous souqs (markets), mosques, gardens, palaces, restaurants, guesthouses and anything else a tourist might need or want. Dating back to the 12th century, the medina is a true labyrinth and a joy to wander around and get lost in. Saadian tombs from the15th C.
How do I get out of here? While traffic is banned in the souqs, you are likely to be shoved against donkey carts, delivery push carts, rickshaws, scooters, bicycles and hoards of tourists, all in a pleasant, friendly way. Shopping opportunities in Marrakesh include leather hand-stitched slippers/bags, anti-snoring remedies, perfumes, argan-oil products, textiles, jewellery, carpets, instruments, lamps, honey, dates and olives threatening baggage allowances many mint teas later. You name it, we bottle it! Darina’s dream house One site well-worth visiting is the Majorelle garden. 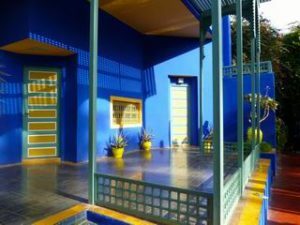 Created by the French painter Jacques Majorelle, it has an amazing colourful collection of cacti and plants from all five continents, as well as the ashes of Yves Saint Laurent who acquired it after Majorelle’s death in 1962. Framed in Marrakesh! What a frame! Fixing nets, Essaouira To save 3 days of headwind through a flat uneventful stony desert, we opted for the bus to Essaouira on the Atlantic coast. This white-washed fishing port and medina is a popular tourist destination with beautiful riads (traditional houses) as guesthouses, many owned by Europeans and run by locals. The main road south was quiet and quite scenic once the morning fog had lifted. We even had substantial tail wind making for a pleasant ride. … it’s not for the birds!!! Drivers are very generous with space on the roads. Dar Naima guesthouse in Imsouane Accommodation was low on the ground and so it was necessary to head down to the next coastal surf spot, where there was no shortage of guesthouses and eateries. Sunset in Agadir Flattened by an earthquake in 1960, Agadir has little in the line of architecture from former years. However, in 1992 a medina was built in the outskirts of town, mirroring the style of ancient cities with admirable attention to detail. Another positive aspect of Agadir is the beach front promenade, where local and foreign tourists throng to admire perfect sunsets! There are many reminders that Islam is alive and well, including numerous daily calls from the mosque at prayer time, as well as signs in hotels indicating the direction of Meca. As a result of French control from 1912-1956, visitors can get by relatively well with the French language, and many locals also have basic English. A day trip with a shared taxi to Taroudant was a fruitful shopping excursion for Darina, who haggled to her heart’s content in true Monty Python style at the numerous leather markets! Slippers to beat the band! In the kitchen with the tajines Lunch and dinner consisted of five main options: salads, omelettes, skewered meat, couscous or tajines. The latter is a terracotta pot with a lid for cooking casseroles of meat , fish or vegetables over hot coals for hours and is served with pita bread. Alcohol is rarely available, but the orange juice is excellent! A main course, away from tourist centres, generally costs about 3 or 4 euros. Our favourite part of the trip was the ride through Paradise Valley, just north east of Agadir. This picturesque gorge of palm trees and streams is relatively green and a welcome change from some of the more desolate desert landscapes we had further north. It was an agreeable 20°C by day and a cool 6°C in the evening, making open fires in the restaurants very welcome. So good, I think I’ll ride it twice! Main Agadir – Marrakesh road (N8) After a long pleasant climb through the gorge, we were rewarded with a spectacularly beautiful 12 km downhill spin to the main Agadir-Marrakesh road. There, the scenery continued to impress until 100 km before Marrakesh, where the flat, stony desert re-emerged. Back in Marrakesh, it was time for some last-minute shopping and a visit to the 1001 Nuits hammam (spa). There, in fabulous traditional surrounds, a couple of big Mamas (who don’t take “no” for an answer) scrub you till your whole body tingles, in between black argan soap and mud treatments, as well as steam room stints, before finishing it off with an argan-oil massage and… a cup of mint tea! The absolute business – 2-hour pampering for 35€. 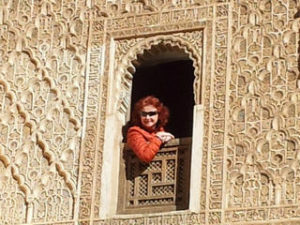 Accommodation generally came in the form of a riad (traditional house with an interior patio). Despite their location in busy souks, they can be amazingly quiet havens from the hustle and bustle outside. One thing to note is their proximity to the mosque if you don’t appreciate 4am wake-up calls! Prices ranged from 30-45 euros/night for a double en suite with breakfast included, which was usually a generous continental affair with some local fried bread as part of the deal. 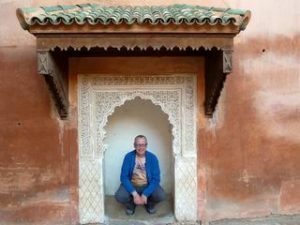 Riad Samarine Of the three great riads w e experienced in Marrakesh, we can highly recommend Riad Samarine as top notch for service, comfort, location and value for money. Their evening meal was also the best we had in Marrakesh. We found the people super friendly and also genuinely helpful in showing us the way, without bringing us to their uncle’s carpet shop! Even in the souks, if the shop assistants saw that we weren’t interested in buying, they stopped their sales talk, and a gave us a slap on the shoulder with a warm “Welcome to Morocco!” Fancy a cuppa? Moroccan flag Morocco was a pleasant surprise. The food, people, landscapes and drivers all get the thumbs up. Although this trip didn’t entail many kms, it was a fabulous taste of what Morocco has to offer. 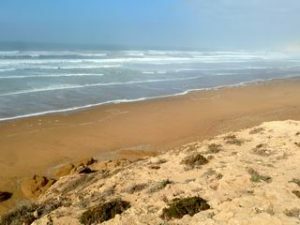 Watch this space – the Moroccan chapter is not yet closed!